Home » WordPress Plugins » Yoast SEO » How Do I Change the Permalink Structure? How Do I Change the Permalink Structure? 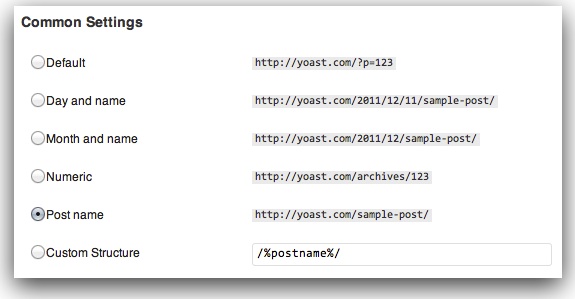 We highly recommend you use just /%postname%/ for your site structure for the reasons covered in this article. If you are using the default permalink setting ( http://www.example.com/?p=123), we will display a notice that recommends changing the structure. On the left-hand side, you will see a menu. 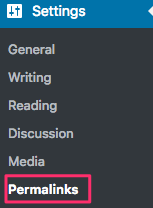 In that menu, click on 'Settings'. The 'Settings' menu will expand providing you additional options. Click on 'Permalinks'. Use this tool to generate the correct code. Add the code you generated in the previous step to your site's .htaccess file. Not sure how to edit the .htaccess file? We have a 'How to' guide available here.